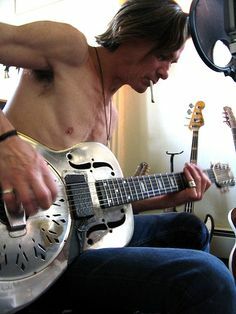 Many thanks to Andi Lechner for writing this post about one of Chris Whitley’s signature pieces of gear. 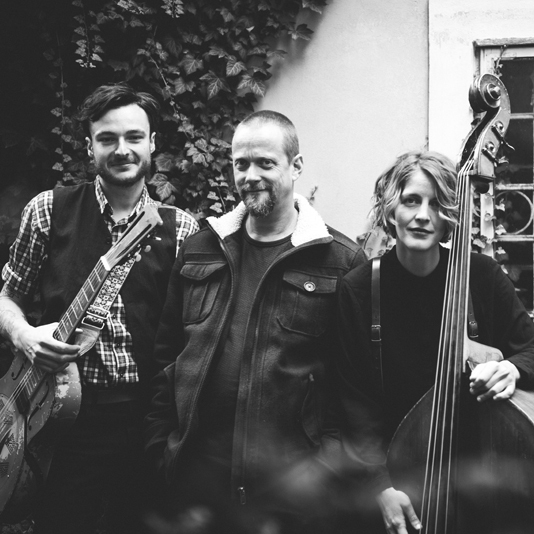 Andi is a musician (singer-songwriter) based in Austria, where he fronts his band (Ghost and the Machine) playing resonator guitars. NOTE: This article should just provide information about the pick-ups that Chris used on his Nationals. I don’t want to promote them or say they are the best whatever that means, but rather to provide a little insight. 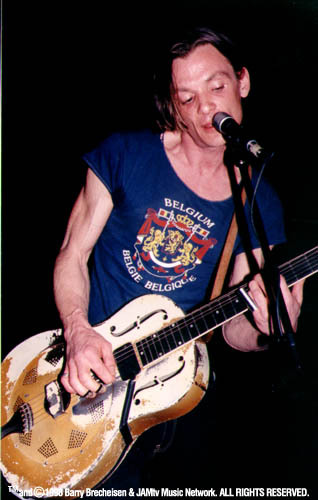 The amplification of resonator guitars (like Chris plays them) has always been a very touchy topic. This has various reasons: one, these guitars are very prone to feedback when played live; two, they simply do not provide the required space for installation of a normal guitar pick-up simply because of the way they are constructed. 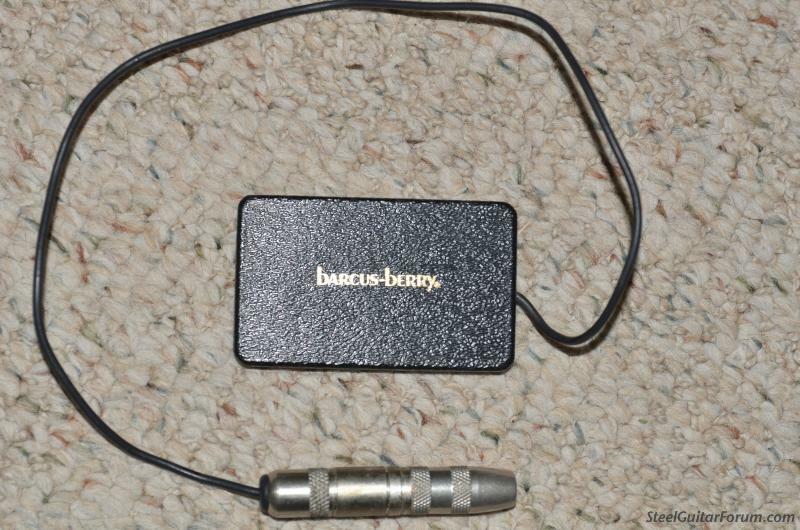 Nowadays there are a many great sounding resonator guitar pick-ups out there and the selection is bigger than ever, but it seems that the resonator community has chosen the Barcus Berry Hi-Tek as their holy grail – and it was Chris’ weapon of choice too. This pick-up is very very rare these days and highly sought after. On several internet auctions they change owners for hundreds of dollars (the highest bid I’ve ever saw was about 600 Dollars). With that in mind, let’s get nerdy. 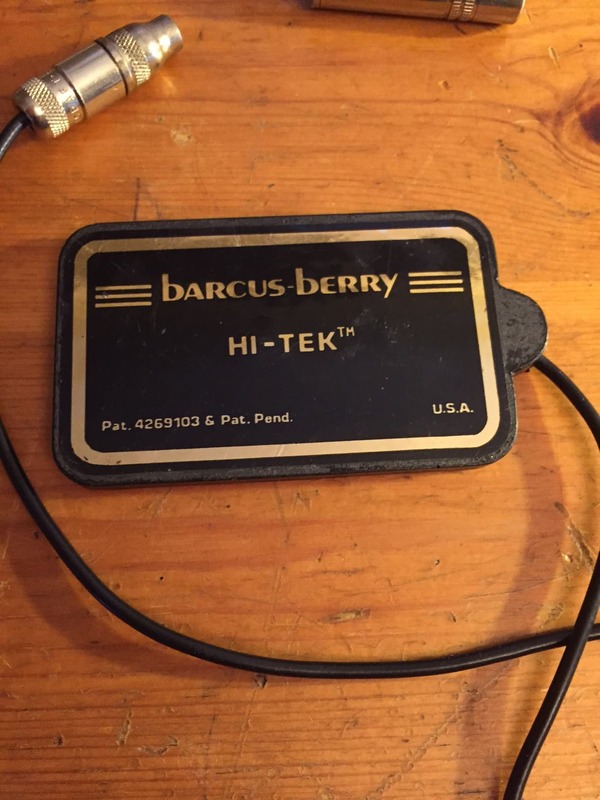 I have owned 5 Barcus Berry Hi-Teks now (I sold 2 of them), in total I’ve heard about 10 BBs, and there’s one thing I can defnitley say : they ALL sound different! They do not only differ in tone, they also differ in output (which means – simplified – how loud/fat the pick-up sounds), which can be a real problem if you use more than one guitar. (To be more precise: the most quiet one I’ve owned had an output of 2.75 Kilo-Ohm, and the loudest 10.6 Kilo-Ohm!). It took me years to get two approximately identical-sounding pick-ups for my two Nationals, so, as you may notice, they are not necessarily very easy-going. As I’ve mentioned before, I had the opportunity to listen to quite a lot of BBs and I want to be honest with you: not all of them sounded good to my ears. A few sounded average to bad, and some of them sold on eBay, etc. are simply not working correctly. The reason is that the construction is quite off-the-wall, and Jason Lolar (a pick-up guru who once worked for Barcus-Berry) has said that the return rate of these pick-ups was very high. On the other hand, I want to be honest with you: the best Barcus I own (mounted on my 1929 Polychrome Triolian) is a real monster and – for me – the best resonator pick-up I’ve ever heard. It is loud, it is dynamic; it sounds very warm but also delivers the acoustic character of the instrument. So as you can see, the quality of and your satisfaction with a BB pick-up depends on how lucky you are. Clearly, Chris had good luck in his selection of BBs. 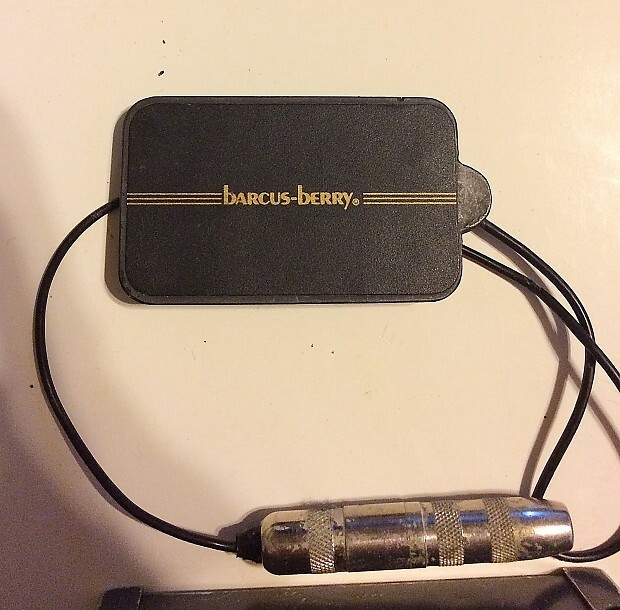 I am aware of four different models of the Barcus-Berry pick-up. This was the first model (introduced in the 80s), and as far as I know Chris never used this pick-up. Compared to the other models, the Model 1 I own sounds more acoustic than the others I’ve heard. My guitar tech analyzed the pick-up a little and found that the wiring of this early model differs from later ones. I don’t want to get too technical, but for all you gear heads out there, the subsequent models tend to sound like a humbucker, whereas this one sounds more like a P90. This model is Chris’ infamous Triolian pick-up, and he also used it on his later new Style O! Model 2 pick-ups have character: they are warm, a little more dirty, and very powerful. Unfortunately, these models also have the biggest fluctuation in range, but if you’re lucky you’ll get a pick-up to die for! As you can see on the photo below, Chris somehow mananged to pull off the sticker on the upside of the pick-up (which is not easy), but I don’t think this has a measurable influence on the sound. Chris’ pick-up of choice for his 14-fret Style O guitar! This model is not as warm as Models 1 & 2, but is very acoustic and transparent, which makes it ideal for lower tunings. Chris used it exactly for this, since he used his 14-fret Style O for the lower tunings). To my ears it sounds more balanced than Model 2. The housing of this model is made of plastic, whereas the housing of Models 1 & 2 is sort of a blend of various chemicals (the name slipped my mind). What’s very important to know is that this model is taller than those mentioned before! This can be a problem on some resonator guitars, but the good news is that you can grind it down a little (which I did), so you can get it more flat. This was the last Hi-Tek model. Chris never used this model to my knowledge. I didn’t even find a photo of it on the Web. A good friend of mine once owned one and he said that they were not usable for resonator guitars because of their height. He used it on his dobro, and it sounded quite average. Just thought I’d pass that on to you even though I don’t have personal experience with this model. Alright, I hope I shone some light in the dark – see you! They had a clip to attach to the sound hole of a regular acoustic only there were single coil!!! I see a lot of people on ebay buying them and removing the clip to put on a resonator guitar and they don’t sound right!!! I used to play with John Campbell in NYC in the late 80’s and Chris came to see us regularly. John used this pickup and that’s where Chris discovered it. Chris was a wonderful, complex guy with enormous talent. Yup John was the man !